This week’s text is one that always makes me smile. In Mark 6:1-13, Jesus has come home for a visit, and when he teaches in the synagogue all his old family friends and neighbors are blown away. They just can’t believe that the kid they watched growing up has become so wise and accomplished. They are more than surprised. They are offended. It is not an unfamiliar sentiment. In all kinds of groups there is a subtle pressure to not stand out. I remember one summer job where I worked until the break whistle blew because working was less boring than slacking. But boy did I get flack from the crew for not slacking. It happens in the church too. I’ve seen a prayer group squashed by a pastor who felt threatened by lay people taking action on their own. I’ve seen thoughtful new worship initiatives squashed by lay people who saw any innovation as a danger. So the people who knew Jesus best were offended by his wisdom and his power. How dare Jesus grow up and use the gifts he has been given? How dare he flourish? How dare he stand out from the crowd? Then comes the funny bit. Personally I think that’s hilarious. On his worst day in ministry all he could do was miraculously cure some sick people. That’s actually better than my best day. Just sayin’. Mark’s Gospel, as I’ve noted before, is often teaching lessons about what faith is, whether the word “faith” comes up in any given story or not. This passage teaches at least three good lessons on faith and faithfulness. My first observation here is that the faith of the crowd, or rather their lack of faith, inhibited Jesus’ effectiveness. The reason I can’t do anything good around here is that the people just don’t believe. They are so critical. But probably best not to see ourselves in the role of Jesus here. Better to see ourselves in the role of his family friends and neighbors. We need to welcome him back to the neighborhood—to believe in him, to applaud his wisdom and his acts of power. Maybe the more we welcome him the more he will be able to do in our communities and in our lives. But there is a second lesson here: it is the lesson of what Jesus did in light of being rejected by his peeps. Sometimes you just need to move on. There is wisdom in not staying the course to the erosion of your spirit and the wasting of your resources. You could argue that faithfulness is valuable in itself, and you would be right. If at first you don’t succeed, try, try again. Then quit. No need to be a d***** fool about it. But on the other hand, moving on and teaching everywhere was Jesus’ calling. He wasn’t called to be the residential rabbi of the Nazareth Synagogue. He had a world to save. And this itinerant ministry was exactly what he was teaching his most devoted disciples. His instructions to the disciples are instructive about the ministry and the life he himself modeled. He sent them two-by-two. His followers were not to go alone — just as he himself did not go alone. He lived and worked in community, with three close friends, twelve chosen apostles, and seventy (or seventy-two) mostly unnamed missionary leaders. We would do well, in our individualistic world, to heed this message both for ministry and for life. Christian living is a matter of community, making and building and mending ties of genuine love. It can feel impossible at times, but one must keep attempting to draw close. The solo Christian life just doesn’t work. Our faith is designed for a shared life, a common discipline. Ministry, likewise, is not a solo affair. Every solo pastor knows how lonely the work can be. It takes creative effort and risk to be in deep partnership, first within the church with non-pastor leaders, and outside, building teams and communities of shared mission with other pastors. He sent them poor and dependent. Frustrating as it may be, he did not give them an endowment or a pension. He sent them out with inadequate resources, forcing them to depend on the welcome and support of those they would serve. He sent them out with discernment and choice. Tempting as it may be to think that we are utterly bound by this dependence on the generous welcome of those we serve, Jesus gave his followers an escape route. 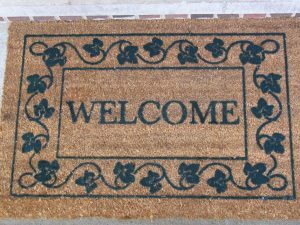 They had to discern whether they were truly welcome and supported or in fact not welcome. If the verdict was that they were not welcome to stay and serve Jesus, then faithfulness to Jesus meant saying goodbye. It also can be rather satisfying. Long ago in a job unrelated to ministry, a temp job, actually, I had to go door to door to every street-level business in a section of downtown Seattle. My task was to explain a new product from a credit-card company. One day the next stop was a seedy bar, empty as a desert in the early afternoon. The manager let me start my spiel, but constantly interrupted to berate me. He had some bad history with the company that sent me, and he wanted me to pay for it. I realized I was being abused. I was not, in fact, welcome. I turned to leave. As I reached the door, just before stepping into the sunny outside world, I wiped my feet on his mat. That’s good! I think the idea of kicking the dust off your feet is bold statement and funny. It is easy to read these Gospel passages and hear only familiar pious tones.